@Sizzla876’s “Woman I Need You” Sampled On @DJKhaled’s “Grateful”! “Oh she cute eeh?” are the opening words to Reggae Artist Sizzla’s “Woman I Need You” single from his critically acclaimed 2002 album, “Da Real Thing (Get It Here)“. At the time, Sizzla was on a blazing trail thanks to his “One Of Those Days (Dry Cry) single, but today he has another high point in his career. Today marks the release of DJ Khaled’s 10th studio album, “Grateful“, and Sizzla is both featured and has his 2002 single sampled on the album. “Woman I Need You” was produced by Bobby “Digital” Dixon for Digital-B Records on the “Dem Gone Riddim“. The sample appears on the track, “It’s Secured” which features Rapper/Producer Travis Scott, and Hip Hop Icon Nas, and produced by DJ Khaled, Cool & Dre, and 808-Ray. This marks the second time the track has been sampled as it first appeared on Rapper Cam’Ron’s 2004 “More Gangsta Music” which featured fellow Rapper Juelz Santana. Digital-B Records has been a part of many successful singles from the likes of Shabba Ranks, Coco Tea, Morgan Heritage, his son Giark, the late Garnet Silk, and was the Producer of Sizzla’s “Black Woman and Child” album. DJ Khaled’s “Grateful” album also features Dancehall Artist Mavado with production from Jamaican Producer Troyton. The album is now available on iTunes, and all streaming services. Check out the tracks below. If you’re a listener of Dancehall Music, then you’ve heard the name “Shabba Ranks” before. One of the greatest Dancehall Artists that ever stepped on stage, we’ve called him “The Grammy Kid“, “Emperor Ranks“, and “Big Dutty Stinking Shabba” to name a few. As child he was one of the few Deejays I’ve looked up to, when he dropped music videos and stage performances I was glued to the TV screen despite my family complaining of how “slack” his music was. Today, on Oldies Sunday I present to you a few of his songs, and the singles that have sampled/paid tribute to him. What are your favourite Shabba Ranks singles? Let us know in the comments section. Let’s go! Dropping a new single that is sure to keep you grooving is DBurnz! Titled “Bet You Never Know” and produced by Digital-B Records, the artist serenades a young lady letting her know that he has his eyes on her and depends on time to bring them together. Something for that special one in your life, if you’re afraid to speak up, let this song give you that confidence boost. If you’ve watched the National Awards today, you might have caught his rendition of Bob Marley’s “Redemption Song“. What do you think of this song? Check it out below and share your thoughts in the comments section. In recognition of May being Child’s Month I present to you a hit from a great Reggae act, Tony Rebel. 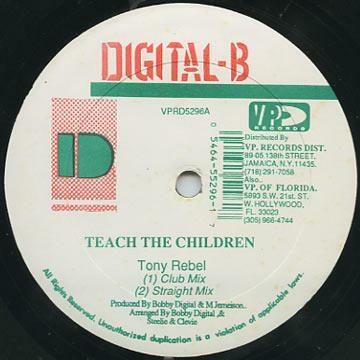 Titled “Teach The Children” which was produced by Bobby Digital (Digital B) and released in 1994, this is message music encouraging good upbringing of children. He speaks on the action of adults being a influence to children along with the saying “If you want a good cow, you better grow a good calf“. Watch what you say to children, they need guidance and good upbringing. Today’s Oldies Sunday selection comes from a legendary Reggae Artist, Sizzla Kalonji. Titled “Black Woman And Child” which was produced by Bobby Digital and released in 1996, we hear Sizzla showing love and appreciation for the black woman, promoting consciousness, Africa as the mother of all mankind, and Queen Omega. 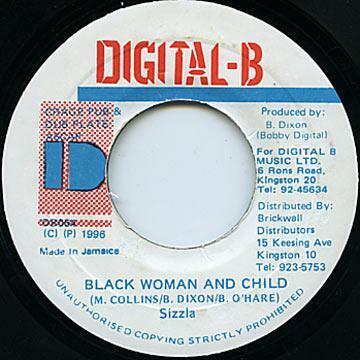 “Black Woman And Child” is one of Sizzla’s most popular singles and is a part of 2nd album of the same name which was released in 1997.